Having trouble with your final paper? Want feedback on your newest novel? Citations getting you down? 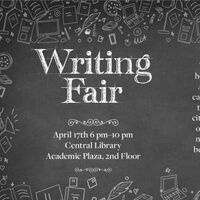 The UTA Central Library is hosting a Writing Fair in the Academic Plaza where you can get feedback on anything from research papers to mystery novellas. Writing tutors will be available, free games, food and drinks.